The United States Congress designated the Henry M. Jackson Wilderness (map) in 1984 and it now has a total of 102,907 acres. All of this wilderness is located in Washington and is managed by the Forest Service. The Henry M. Jackson Wilderness is bordered by the Glacier Peak Wilderness to the north and the Wild Sky Wilderness to the southwest. Senator Henry Jackson of Washington was instrumental in the designation of many of the state's Wildernesses, and this "forest" of fabled peaks recalls his efforts. Straddling more than 30 miles of the craggy north-south trending crest of the Cascade Mountains, with deep glacial valleys spreading out east and west from the crest, this Wilderness is perhaps most distinctive in its northwest section. Here you will find terrain reminiscent of the Swiss Alps: glacial basins surrounded by raggedy ridgelines supporting sharp spires and imposing rock towers, attractions to many mountain climbers. Snow often accumulates to a depth of 20 feet in the higher country, and remains well into summer, eventually melting into the 60-plus lakes, which range from small pools of water to Blanca Lake's approximately 180 acres in the northwest section. A tall forest covers the lower elevations, then thins out and changes in species to eventually open into broad meadows on many ridge tops. This Wilderness shares its northeast border with the huge Glacier Peak Wilderness. 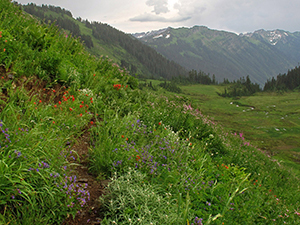 The Pacific Crest National Scenic Trail (PCT) winds down the high heart of the area for about 32 miles. Other trails snake up from the east and west to join the PCT. The Blanca Lake Trail leads 3.5 miles to Blanca Lake, and five short pathways approach the center of the northwest section and fade to bushwhacking terrain. Planning to Visit the Henry M. Jackson Wilderness? How to follow the seven standard Leave No Trace principles differs in different parts of the country (desert vs. Rocky Mountains). Click on any of the principles listed below to learn more about how they apply in the Henry M. Jackson Wilderness.